Another project? Just what I need right now! So, a few days ago, I decided that I needed some stitch markers. And um... I went on Etsy and bought fifty of them. It seemed like a great idea at the time - they were less than $3 for 25 of them, so I thought, I'll get two sets! Then, when they break, which they will because no one sells durable things for that cheap, I'll have plenty more and I won't have to worry! After I'd ordered them, I realized that I live in a dorm and have absolutely nowhere to put fifty stitch markers. Crap. Okay, okay, no problem... I can handle this. 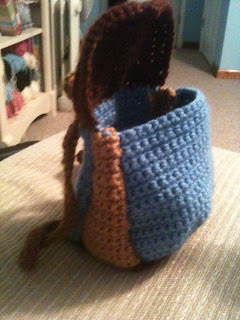 I have yarn with me, so I shall make a bag! My favorite site to look up patterns is crochetpatterncentral.com. 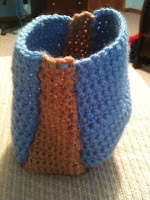 It's a free site and has hundreds and hundreds of patterns. The only problem is, there's a new layout which is much harder to navigate than the old one was, so I don't like spending time there anymore. And things like bags... well, there are millions of patterns! I could spend all day looking through the pages of patterns for bags! And it's not like it lists the whole pattern - just the names, which link out to the site where you can then read the pattern. I got in and out as quick as I could with a pattern for a kid's backpack, which looks promising. Except that... I didn't like it. I didn't like the colors and it was too small and I didn't want to have to use two strands of thread, especially since I only have one ball of the color and it's a tiny one at that. So here I am, making my own pattern. Now... I didn't think this was worthy of a blog post until after I'd done the base and part of one side, so I don't have pictures of working on those parts. I picked multiples of six so that I could split it evenly into four parts, with the front and back panels twice as big, like I said. I'm thinking that the side panels will start at 11 and decrease to maybe 4 or 5. I'm also thinking I'll need at least 40 rows. Also, I think I do need to decrease the front and back panels as well - the back more than the front. 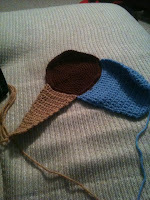 I know I said 40 rows, but it looks like this is good, so I'll fasten off here and get to work on the sides. I've decided to make the sides 13, instead of 11, with the two outside stitches sharing a space in the first row with the front and back panels. That will eliminate a little bit of a gap in the bottom. That space always drives me nuts when I'm making something with pieces to be sewn together. Sides: join in the same st as blue front panel. [picture here] Well, I know I'm very nearly done, but it isn't what I want. I don't like how wide it is at the bottom, so I'm going to rip it all out and start again. I also think that the panel I labeled "front" should be the back, instead. Sides: join in same st as blue. Okay, that looks good! Now, fasten off and do the same on the other side. Well, it's hard to see in the picture, but I'm really pleased with how this looks so far! I want the front to protrude more, be a lot rounder. I'm thinking I'll increase over the first few rows of the front and then gradually decrease up to the top. We'll give it a try. 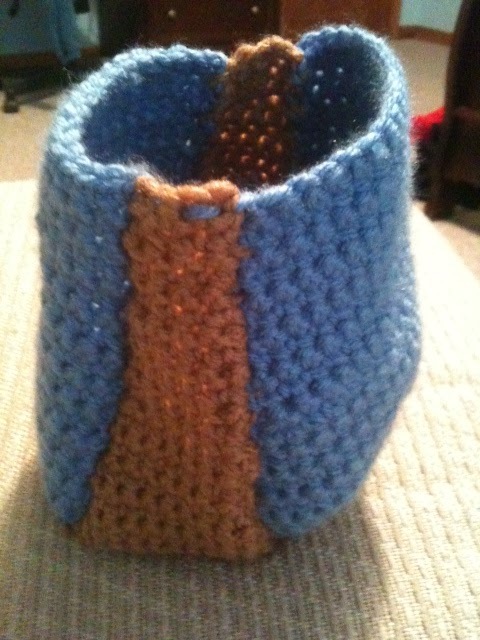 FRONT (for real) - join blue in same st as brown. And okay! There we go. All four panels done, now to sew them together! Then all I'll have to do is experiment in how to make a long semicircle (I guess, a semioval) for the top. As you can see, the sides are a little misshapen, but I'm not worried about that. I could probably fix it if I wanted to, but it won't affect the integrity of the bag and this is just a storage bag, not something I plan on carrying around. I'm not too worried about how it works. I looked around the internet and I can't find any semioval that I like, so I guess I'll have to make it up. I've done something like this before, in the converse slippers I made a while back, but I'm not really looking forward to it. 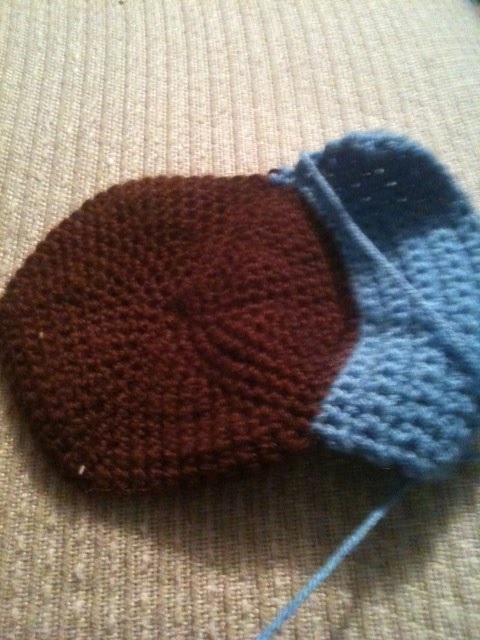 It's just tedious to get the shape exactly right. To do it, I'll use a combination of sc and hdc. This shape is absolutely perfect, but... still way too small. 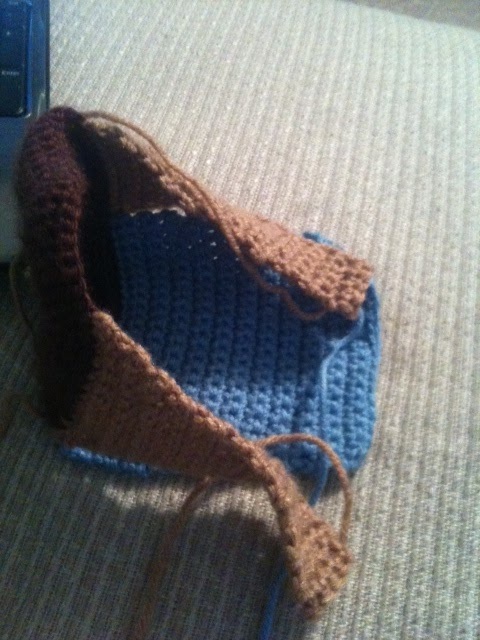 Normally I would just do sc rows until it's big enough, but that would make the edges curl instead of laying flat. 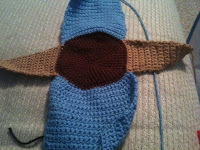 I don't want that, so I'll have to keep increasing the number of stitches until it's as big as I want. 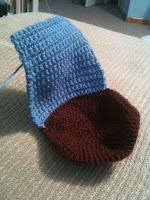 I think I'll go to just using hdc so that the stitches are a little taller and I won't have to make so many rows. Well, it's now as wide as I want it, but not as long. I'm running out of this color, so I'm thinking I'll do two rows along the bottom (hdc) and then a sc row around the entire thing, if I can. Then I'll use whatever is left to sew it to the rest of the bag. 11: sc around. In the middle, ch3 for buttonhole. Skip no sts. fasten off. And there's not a lot left, maybe about six inches, so I'll go ahead and trim it off, then sew it on with blue. I have lots of blue. 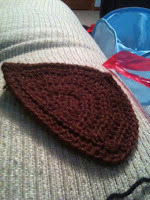 I'm also going to make straps (purely decorative, obviously) and a loop on top so that I can hang the back somewhere. Shouldn't be too hard. I don't have enough of the tan I was using, so I'll use a slightly darker brown. It should still match. If it doesn't, well, I'm not really bothered. And there! All done! Sew in the ends and you're ready to go! Probably a small child could wear this, if you wanted, but mostly I just want to put things in it and tuck it away somewhere. When I get back to my dorm room and my button stash, I'll sew a button on it to keep it closed. For now, I'm pleased with this.